Combat-effective bleed kit to help you stop severe bleeding in the field. Our goal is to help ensure that every person who enjoys the sport or use of firearms for self defense is prepared for the unthinkable. While our sport has an exceptional safety record, we know that bad things can happen. That is why we emphasize safety in all of our training, and it is why we emphasize preparedness at all times. We believe that shooting professionals, active shooters, and armed citizens have a responsibility to be trained and equipped to deal with bad situations. It is to that end that we offer our line of emergency medical products. Rapid blood loss from an arterial injury is one of the most serious life-threatening situations that we are likely to face. In such a case, paramedics may be minutes or even hours away, and stopping an arterial bleed before they arrive, may well be the difference between life and death. The increased survivability of the military battlefield in recent years is largely due to new techniques and technology being applied to stop bleeding immediately after an injury and before transport. 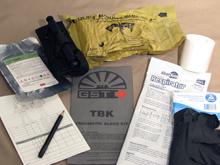 Our TBK makes puts these same technologies at your disposal, including a SOF tactical tourniquet, an OLAES modular bandage, and a military grade hemorrhage control agent. No amount of equipment can take the place of good training. We strongly encourage you to get the best emergency medicine training that you can find. Additionally, you are strongly adviseed to review the training videos below to make sure you understand the proper use of the life saving tools included in your kit. We can customize a kits to meet your needs.If interested, please use our contact form. Examples include: ESK Emergency Surgical Kit, CMK Combat Medic Kit, PAB Patrol Aid Bag, and IFAK Individual First Aid Kit. We are planning to offer a workshop with certified medical trainers to include hands-on training using our TBK including real-world scenarios. If you are interested in scheduling a course for your group, please contact us with your interest.